1. a. A merchant, trader, dealer, or trafficker (freq. of a specified commodity); (from the 16th cent.) a person engaged in a petty or disreputable trade or traffic. Sometimes short for an established compound such as cheesemonger, where the context makes this clear. Cheese is alive with microorganisms: bacteria, yeasts, and molds whose metabolizing action on the sugars and proteins in milk generates the aromas and flavors and textures that say “cheese” to us. The process of cheese “becoming” does not end once curd is separated from whey and pressed into molds; it continues through the alchemy of ripening. Indeed, cheeses are never done ripening; they continue to mature until they are eaten and digested, or—if too far gone—tossed out fully to rot. Cheese’s mutability makes it a challenging, but also potentially quite satisfying, item to retail. This essay elaborates on the contemporary art of artisanal cheese retail. I am not talking about plastic-encased rectangles of supermarket cheese chilling alongside cartons of milk and yogurt in tall dairy cases along the back walls of superstores. That cheese requires a different story, one that begins with the mid-nineteenth century move of American cheesemaking off the farm and into cooperatively owned factories where farmers pooled their milk to be processed by hired craftsmen. Variability remained an issue until the introduction of pasteurization in the 1930s, an innovation adopted for market reasons of consistency, standardization, and economies of scale; pasteurization meant that cheese could be safely made from older milk that had traveled greater distances. Today, cheese destined for the dairy case (or a pizza, for that matter) is fabricated using automated machinery and molded in 40-pound blocks that are immediately encased in protective plastic to prevent bacteria and molds from growing on their surface during ripening. The history of cheesemaking’s industrialization is a tale of gaining mastery over cheese’s organic variability as a means of scaling up production and extending shelf life. Artisanally manufactured cheese embodies different values. It is made in relatively small batches using minimal technology and often, increasingly so in the United States since the 1980s, on the dairy farms that provide the milk. Such cheeses may be allowed to age in the open air, even resting on wooden boards conducive to the very microbial colonization of their surfaces that vacuum packaging is intended to avoid. 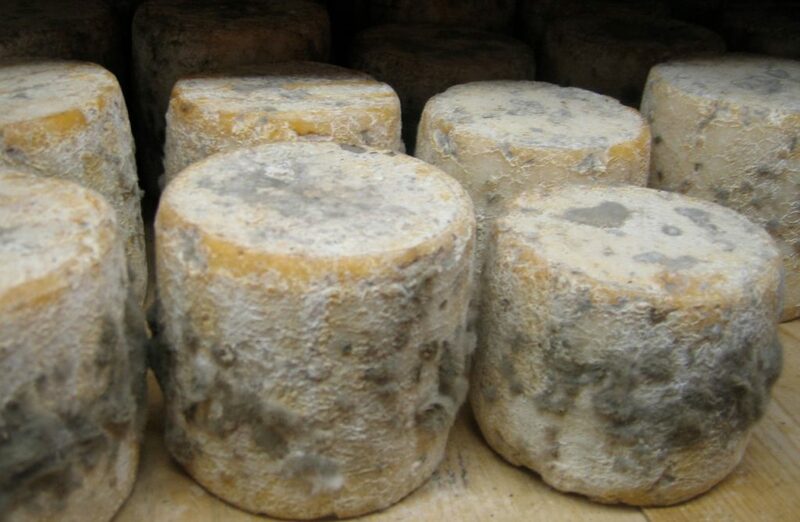 Artisanal cheeses do not “go moldy” so much as they develop “natural rinds,” which require a good deal of sustained human labor in “turning” (e.g., flipping over), “washing,” (rubbing down with a brine solution) and brushing the cheeses for months on end to develop. Those rinds—and hence the appearance, taste, and desirability of the cheese—vary from producer to producer, from batch to batch, and from wheel to wheel. It takes skill not only to make such cheese, but also to sell it. Unlike traders of standardized commodities who sell almost exclusively on competitive pricing, specialized cheese retailers, known as cheesemongers, trade in goods whose value is invested in connoisseurship (Gewertz and Errington 2010:68). Mongers’ knowledge of the vagaries of cheese—how it’s made, by whom, how it will behave in one’s fridge, how best to serve it, even when a cheese is most itself (à point, the French say)—can enhance the commercial value of a good. Call it crafty, call it craft: skilled, reputable cheesemongers move cheese in varying states of decomposition to trusting customers. As David, a young cheesemonger, said to me, “All my cheeses are ticking time clocks.” Perishability creates a drag on merchants’ profitability. David is in the business of selling cheese, as much of it as he can. His maximization strategy is based not on pushing quantity (he wants people to buy cheese they can consume within a day or two), but instead on expanding notions of quality. To mitigate loss by enhancing his inventory’s quality, David’s work is both practical and discursive. The practical job is to slow down the transformation of a cheese’s organoleptic qualities by retarding ripening and heading off rotting. Here, commercial infrastructure of refrigeration and humidity control join David’s practical knowledge of cheese care. The discursive job is to convey to consumers an appreciation for “real” (i.e., nonindustrial) cheese’s fundamental instability so that they know not to expect absolute fidelity in a cheese’s sensory qualities. It’s what a cheese monger has always done. Cheese doesn’t always travel well. The job of the monger has always been to receive the cheese, assess it, and decide what they’re going to do with it to present it best to the consumer. That means that sometimes you have to do what we—the old school—call “cheese care” (Hobbs 2011). A weekly bulletin from the shop where David works (it’s primarily a wine store) once recounted the craziness of catching the cheesemonger in the act of smearing butter on a cheese, as if cheese needed the extra fat! When I mentioned this to David, he laughed at the joke. The cheese was a Caciocavallo from Sicily and the rind had cracked in transit; David described the crack as a “wound” that can open the cheese to microbial infection, so he filled it with a bit of butter, “like a band-aid.” He’d learned the trick from a colleague while working on the other side of town. Such routine yet skilled care of an already-aged cheese is not to be confused with what the French call affinage, or “finishing.” The affineur, a professional cheese-ripener, acquires young or “green” wheels of cheese and undertakes their ripening from the beginning. 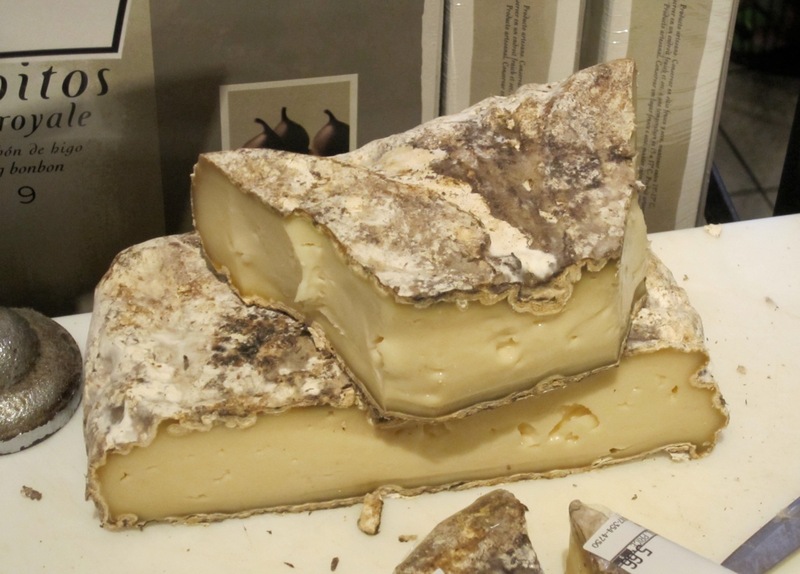 As Dubé would have it, cheese care aims at maintaining a cheese as the producer intended it, whereas affinage purposefully influences what a cheese might become. Such value-adding labor is increasingly being done in specialty shops in the United States. A retail-based affineur might add a locally brewed beer—say, Brooklyn Brewery Local 2—to a brine solution spritzed on the surface of a young cheese that has come into the store. In just such a way, Kinderhook Creek, Old Chatham Sheeperding Company’s mold-ripened cheese, becomes C-Local, a treat only to be found at Murray’s Cheese in Manhattan, where the yeasty transmogrification takes place. For practitioners of routine cheese care to lay claim to the art of affinage—a question raised by a New York Times story in 2011 (Gordinier 2011)—is for many mongers an unseemly affectation. And yet it raises an interesting question: who should take credit for making the cheese what it becomes by the point of sale? For all David’s concerted efforts to slow down ripening, the cheeses, of course, continue to develop, which is to say change. This is where the discursive labor comes in. To sell a cheese that is never exactly as it was before, David narrates a cheese’s qualities as continuously dynamic, such that different qualities (taste, ooziness, odor) might be temporarily stabilized for a given cheese at each point of sale (see Callon et al. 2002). He works to convince customers that one of the charms of artisanal cheese is that the “same” cheese will never be the same, owing to its aliveness (i.e., perishability). In addition to cheese care, then, David practices customer care. In order to sell an unfinished commodity—one whose material qualities are not only shape-shifting but whose value remains culturally and economically underdetermined, a little bit suspect—David encourages customers to reevaluate their judgments. “Last time you didn’t like the Rupert? Try it again” (meaning, try this one, right now), “it’s aged out little more” (or, it’s younger). When I say, “I like Hooligan,” a raw-milk, washed-rind cheese made by Mark Gillman in Connecticut, what I mean is that I like the range of qualities that generally characterizes Hooligan at a particular stage in its life: I would never buy Hooligan without trying a taste from the piece I’m considering purchasing. To me, the cheese is a bit bland when too young and rather off-putting when too ripe; I want to hit my sweet spot. And it’s my spot to hit. Unlike European classics, when it comes to American artisanal cheeses, there is no à point. Who knows when a Hooligan is perfectly itself? There is no ideal type for a cheese named and made by a single artisan (another way in which American artisanal cheeses are “unfinished” as commodities). There are qualities that a particular piece of cheese may embody, and consumers who may appreciate those qualities. David’s job as monger is to play matchmaker. Is this simply cheese care, what good cheesemongers do as standard practice to trade in unfinished commodities? Or is it new-school affinage, turning someone else’s craft product into something unintended? Is it customer care, imparting the knowledge of a connoisseur, or is it a sleight-of-hand trick to get wealthy customers to part with more of their money? At stake is whether cheesemongering should be recognized as a skilled craft, or whether it deserves the taint of disreputable trade, which is one of the meanings of mongering listed in the Oxford English Dictionary. And that question depends more broadly on the status of artisanship in an industrial economy. For producers and mongers alike, it is a marginal status, financially tenuous and prone to romanticization: and thus also morally suspect (Paxson 2013). Questions of scale haunt both. “How Big Is Big Enough (Without Getting Too Big)?” “Is Scaling Up Selling Out?” These panel sessions at meetings of the American Cheese Society I’ve attended were organized by and for producers, but they could speak equally well to many retailers’ concerns. Can small retailers of artisanal goods scale up? Well, sure they can. Manhattan’s Murray’s Cheese stocks deli case outposts in Kroger supermarkets. Does scaling up effect the condition of the cheese as it’s presented to potential consumers? Of course it does. Wedges prewrapped in plastic will never match the condition of cut-and-wrap: but then again, cut-and-wrap at my local Whole Foods Market is not the same as buying cheese from David’s cheese counter. It’s not just that David is more knowledgeable; his cheese is in noticeably better shape, in part because he’s handling a smaller inventory. And—surprise!—David’s cheese is not any more expensive for me to purchase. Retail mirrors production: larger retail operations move more product and generate greater corporate profit, while smaller operations that work “by hand” and offer a more intimate shopping experience see lower profit margins. At the same time, “little guy” status generates customer loyalty for retail shops as well as for craft producers. Regular customers, after all, trust “their” mongers to steer them toward the best cheeses, not just the ones that are overstocked or may be reaching the point of no return, which, with cheese, is always a possibility. For many cheesemongers, participation in this sort of economy of sentiment—more than the possibility of increasing profit—makes mongering a job worth doing. Callon, Michel, Cécile Méadel, and Vololona Rabeharisoa. 2002. “The Economy of Qualities.” Economy and Society 31(2):194–217. Gewertz, Deborah and Frederick Errington. 2010. Cheap Meat: Flap Food Nations in the Pacific Islands. Berkeley: University of California Press. Gordinier, Jeff. 2011. “Cheese: A Coming of Age Story.” New York Times, October 4. Available at link. Hobbs, Peter. 2011. “Fromage Fight? NY Times Article Touches A Nerve in the Cheese Community.” Nona Brooklyn: What’s Good Today? [blog], October 16. Available at link.